Torture has lately become front page news, featured in popular movies and TV shows, and a topic of intense public debate. It grips our imagination, in part because torturing someone seems to be an unthinkable breach of humanity--theirs and ours. And yet, when confronted with horrendous events in war, or the prospect of catastrophic damage to one's own country, many come to wonder whether we can really afford to abstain entirely from torture. Before trying to tackle this dilemma, though, we need to see torture as a multifaceted problem with a long history and numerous ethical and legal aspects. Confronting Torture offers a multidisciplinary investigation of this wrenching topic. 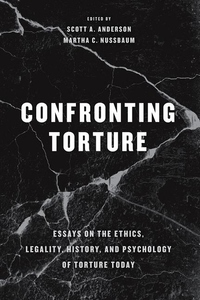 Editors Scott A. Anderson and Martha C. Nussbaum bring together a diversity of scholars to grapple with many of torture's complexities, including: How should we understand the impetus to use torture? Why does torture stand out as a particularly heinous means of war-fighting? Are there any sound justifications for the use of torture? How does torture affect the societies that employ it? And how can we develop ethical or political bulwarks to prevent its use? The essays here resist the temptation to oversimplify torture, drawing together work from scholars in psychology, history, sociology, law, and philosophy, deepening and broadening our grasp of the subject. Now, more than ever, torture is something we must think about; this important book offers a diversity of timely, constructive responses on this resurgent and controversial subject.